Debt can be a useful tool for funding important goals in life, but excessive or unmanageable debt is never ideal. What do you do when you find yourself no longer able to manage your budget, reduce credit card debt, or even meet the minimum repayment requirements? 1. What is Debt Counseling? Also known as “credit counseling,” debt counseling is a professional service that can help consumers make a plan to manage and pay down debts, while outlining a healthy budget moving forward. In addition to a wealth of information and advice, a good debt counselor provides a structure for accountability on future money decisions and objectives, such as buying a home or paying for college. Your finances are very personal and should not be disclosed to just anyone. Finding the right counselor for your situation will take some research. The FTC recommends requesting information from several agencies. Be wary of any company that charges you before the initial consultation. Once you have a list of candidates, check them for consumer complaints by referencing your state Attorney General and the local consumer protection agency. For your convenience, we’ve listed the top debt counseling services in the next section of this guide, including many free options. Remember to ask questions relevant to your particular financial situation. The right agency should be well-versed in exactly your type of difficulty, confidently directing you to resources that address each of your concerns. For those struggling with debt, there’s no one-size-fits-all solution. You should look into a variety of agencies to determine which is more appropriate for you. You’ll want to select a company that has been in business for years, has good customer reviews, and regularly deals with situations similar to yours. Consolidated Credit Counseling has been in business for more than 20 years and has helped over 5 million people. Consolidated Credit can help you get out of debt faster, consolidate your credit card bills, lower credit card interest rates, avoid bankruptcy, and protect your credit. CuraDebt claims to be “very selective” about the clients it accepts, as the company wishes to ensure they can help each one. CuraDebt helps reduce debts, remove stress, and save money. DebtBenefit.com offers free and confidential debt evaluations with no obligation and no commitments, and offers services in multiple categories from debt management and relief to medical and unsecured debt. 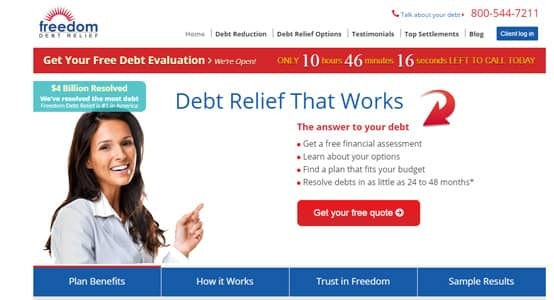 Freedom Debt Relief helps its clients find the perfect solution for them, whether it’s debt settlement, credit counseling, debt consolidation or bankruptcy, and can help find a plan within any budget. National Debt Relief promises to do anything within their power to reduce the burden of unsecured debts, with specialization in debt settlement. You must have at least $7,500 in unsecured debt to qualify. Some credit counseling services are run by non-profit agencies, with an emphasis on continuing education and serving local communities. While being a “non-profit” doesn’t necessarily mean there won’t be fees — or that such an agency is the best option — non-profit debt counseling may be a viable option for your situation. Money Management International has been a leading provider of financial counseling and education since 1958, and offers a wide variety of financial services. Money Management International can help you establish a plan of action for achieving your financial goals. Christian Credit Counselors has helped over 300,000 families get out of debt in its more than 24 years of existence. Christian Credit Counselors can cut interest rates by up to 75 percent and consolidate multiple monthly payments into one. Before trusting a counseling agency with your sensitive financial info (and paying them your hard-earned money), it is always a good idea to check public resources to make sure the agency is legitimate. The Justice Department provides a searchable database of agencies that are compliant to the laws regulating bankruptcy filings and proceedings. This database is updated regularly and searchable by state. 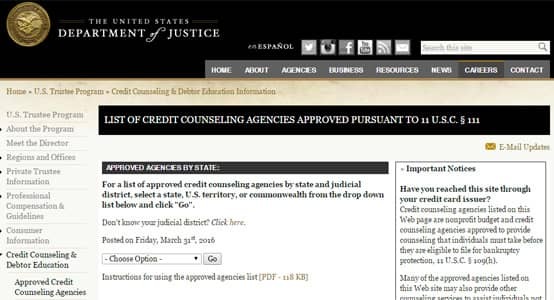 The Department of Justice lets you search through the credit counseling agencies approved in each state. 4. What Might Counselors Recommend? A common myth about debt counseling is that it provides an easy solution to getting you out of debt in the blink of an eye. In reality, your credit obligations still need to be paid — what counseling will do is help you plan how to spend your capital wisely. Financial counseling can be a necessary step toward independence from debt, but hard choices will have to be made. A counselor well-versed in the different types of finances will be able to offer specific advice about credit, bankruptcy, housing, and student loans, but can’t do all the work for you. Credit problems are the most common reason to seek out debt counseling. If your credit card or loan payments are too large for you to make each month or you’re unsure how to pay down multiple accounts, a good counselor will give you the right solution for your specific situation. Customers of counseling services can benefit from a personalized repayment plan, tools for working with creditors, and advice on preventing future credit mistakes. If filing for bankruptcy is your only recourse, it’s important to seek the help of a qualified professional. U.S. law requires that anyone who intends to file bankruptcy must have financial counseling. All bankruptcy filings can be done only after a satisfactory completion of a pre-bankruptcy education program. Only approved agencies can provide this essential service. Student debt is a growing problem burdening America’s graduating youth, with the average amount owed steadily rising in recent years. For this reason, some savvy students (and parents) turn to counseling for help with student loans. A well-trained counselor knows the law, the options for consolidation, and the best way to set up a repayment plan. Student loan counselors can also help you keep more of your loan payment toward principle for a quicker pay-off. The advice of a qualified housing counselor isn’t just for people with mortgages. Even renters can get assistance finding affordable housing. Counselors are trained to direct consumers to the best opportunities for their situation. The U.S. Department of Housing and Urban Development approves and sponsors housing counseling agencies throughout the nation. 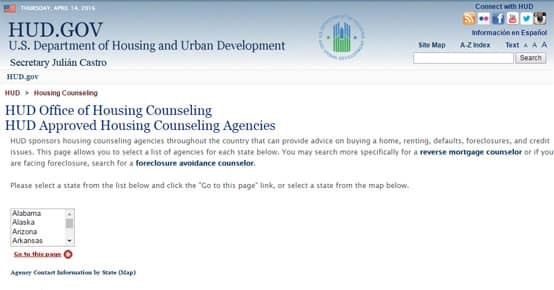 Online, the U.S. Department of Housing and Urban Development makes approved counseling agencies available for consumers to search by state. If you’re a homeowner (or hope to become one), a good housing counselor will know the right program for your needs. These agencies also offer short-sale or foreclosure assistance if necessary. We live in a DIY society, individualistic and uncomfortable asking for help, but when it comes to finances you shouldn’t have to struggle alone. Even if you decide debt counseling isn’t for you, there are other alternatives that can offer vital assistance. Communication goes a long way in getting creditors to work with you. If you’re having trouble making payments, a phone call or written letter may be all that’s required to get payment dates changed or interest rates lowered. Keep in mind, however, that you must call each creditor individually and document each communication yourself, unless you choose to use a debt counselor who’s equipped to handle all creditors for you. 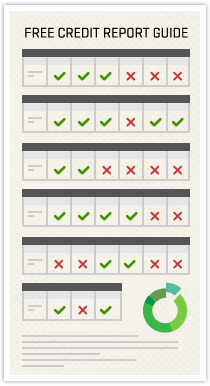 Once a credit account ends up in collections, it’s often difficult to make it go away. Aside from repayment, you have little control in how the collection company will handle your account. Speaking with them may get you a more flexible payment plan, but beyond that, your choices are limited. Online resources like this free eBook can keep you informed about your rights concerning collections harassment: how and when collectors can contact you, what information you can share, how notices should be served, and what language they can use. You can always enlist the help of credit counselor if you find yourself stuck. Negotiating to pay off your debt for a lesser amount is desirable in many situations. This action, called “debt settlement,” requires agreement from both the creditor and debtor as well as a prompt, in-full payment. Debt settlement may negatively impact your credit history, but it’s a way to get out from under crushing debt. Two companies that deal with debt settlements include National Debt Relief and CuraDebt. If you catch your problems early on, a debt consolidation loan may be a viable option for you. By moving all of your account balances toward a single, lower-interest credit account, you can save money on monthly payments or total paid out over the lifetime of the debt. Although debt consolidation isn’t available for everyone, there are ways to get a similar type of deal. An agency can negotiate lower rates on your behalf and collect one monthly payment from you, to be dispersed to each creditor you owe. Debt consolidation companies that might be a good fit include Freedom Debt Relief and Consolidated Credit Counseling Services. Freedom Debt Relief is one of many agencies that assist with debt consolidation and other counseling services. Now that you have a firm understanding of debt counseling and its many alternatives, hopefully you now have a good sense of which option is right for you. If you’d still like to discuss your options with a professional, be sure to check out our top-rated debt relief services to get the expert advice you need. By taking that first step, you could be well on your way to transforming your financial situation for many years to come.